Vital Records Protection : Article 02 : Vital Records Storage -- Off-site vs On-site? Vital Records Storage — Off-site vs. On-site? Title: Vital Records Storage — Off-site vs. On-site? On April 13, a fire destroyed the office building of New Home Building Supply, a Sacramento, California, lumberyard. While the lumberyard didn't burn, the fire caused more than $2 million in damage when it destroyed most of the company's vital records, all of which were stored on-site. According to manager Wayne Stevring, the fire prompted the company to pursue a new vital-records protection strategy that includes digitization of records, daily data backup, and on- and off-site fire-resistant or fire-rated filing systems. More companies, especially since 9/11, are shifting to a combined on- and off-site storage, a "belt and suspenders" approach. While keeping vital records off-site may be an option for archived records, storing current information, such as daily transaction records, off-site can become expensive and time-consuming that it isn't feasible to use an alternate location. A plan that involves off- and on-site storage is preferable except for regulated industries, such as financial services or health care, which have to follow certain storage rules. Most companies employ various combinations of on-site fire-rated vaults, safes, or file cabinets; off-site storage at other locations; and storage at vendors that specialize in off-site vital-records storage. NFPA 232, Protection of Records, recommends, if keeping vital records on-site, storing them in a secure, fire-protected location in a fire-resistant file or vault that has been tested by Underwriters Laboratories or another nationally known independent testing labs. At the end of a predetermined period, two copies of records should be made, one for off-site storage and one for on-site storage and archival records, such as these backups, should be kept off-site. So how do you ensure your vital records are secure while they remain onsite? Vital records stored on microfilm, microfiche, optical disks, magnetic tapes, disks, cassettes, CD ROMs, DVDs, and photographic materials, need special protective measures throughout their life cycle to ensure their preservation. Among these are careful handling and specially designed data cabinets and vaults that supply specific environmental conditions, including temperature and humidity controls. Fire-resistant file cabinets designed for paper and microfilm don't provide enough protection for magnetic tapes, disks, and diskettes because the ignition points of paper and microfilm are much higher than magnetic media's. Paper is destroyed at 400°F (204.4°C), while a magnetic tape becomes useless at 125°F (51.6°C). When picking an off-site storage vendor, make sure you understand all the charges involved, including in and out fees, privacy, security, and what type of care is used to transport the data and the type of facility they're stored in. Also consider distance, accessibility, safety, and service. The storage facility should be far enough away from your own facility to ensure that a major disaster won't affect both locations. Rural and lowtraffic areas can be more secure and easier to guard. Avoid facilities in high-risk areas, including those near airports, railroads, and chemical plants or in flood plains and tornado belts. Also make sure the vendor you choose is accessible 24 hours a day within a reasonable period of time so you can obtain the records quickly. The final element of an overall vital-records approach is the recovery strategy, based on a thorough and detailed knowledge of the records both on- and off-site. 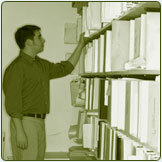 To make sure vital records can be removed in case of a disaster, keep master lists or an index of what's stored where. List specific categories of vital records, develop a document-tracking plan, designate a secure relocation destination, and arrange for primary and backup transportation. Make sure you have the off-site vendor's 24-hour contact information, necessary clearances, and permits, and contact information for internal personal assigned to accompany the records. Finally, train the responsible party to handle and preserve records based on the specific media involved. The immense amount of vital records incinerated or found blowing around the streets of New York City after the terrorist attacks of September 11, 2001, served as a wakeup call for many companies, but it doesn't have to be a terrorist attack. Your records can suffer the same fate at the hands of a disgruntled employee, or during a fire, flood, or some other natural disaster. The key to making sure you have what you need to stay in business is planning. Develop a vital-records protection strategy before something happens, because once in the throes of a disaster, it's far too late. Van Carlisle is president/CEO of FireKing International, a manufacturer of fireproof files and safes and a security and loss-prevention company based in New Albany, Indiana. Title: Vital-Records Storage — Off-site vs. On-site?